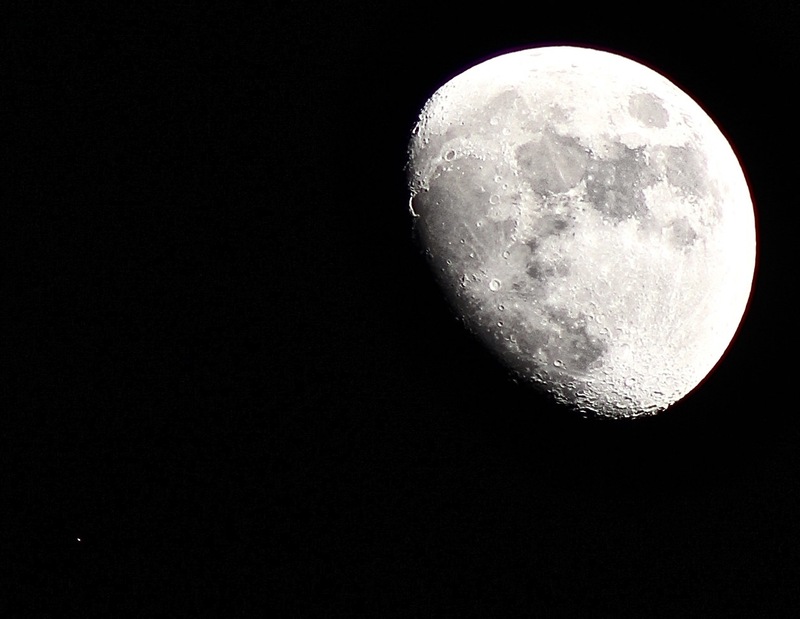 As you’ve probably noticed, the Moon looks different from one evening to the next. Sometimes we see a New Moon, when the Moon is enshrouded in shadow. At other times, we see a Full Moon, when the entire face of the Moon is illuminated. And of course, there are the many phases in between, where portions of the Moon are illuminated. This is what is called a Lunar Cycle, a 29 ½-day period (aka. lunar month) where the Moon becomes brighter and dimmer, depending on its orientation with the Earth and the Sun. During the first half of a lunar month, when the amount of illumination on the Moon is increasing, astronomers call this a “waxing moon”. To understand the Lunar Cycle, we first must consider the Moon’s orbit in relation to Earth. Basically, the Moon orbits Earth, and Earth orbits the Sun, which means the Moon is always half illuminated by the latter. But from our perspective here on Earth, which part of the Moon is illuminated – and how much – changes over time. When the Sun, the Moon and Earth are perfectly lined up, the angle between the Sun and the Moon is 0-degrees. At this point, the side of the Moon facing the Sun is fully illuminated, and the side facing the Earth is enshrouded in darkness. We call this a New Moon. After this, the phase of the Moon changes, because the angle between the Moon and the Sun is increasing from our perspective. A week after a New Moon, and the Moon and Sun are separated by 90-degrees, which effects what we will see. And then, when the Moon and Sun are on opposite sides of the Earth, they’re at 180-degrees – which corresponds to a Full Moon. The period in which a Moon will go from a New Moon to a Full Moon and back again is known as “Lunar Month”. One of these lasts 28 days, and encompasses what are known as “waxing” and “waning” Moons. During the former period, the Moon brightens and its angle relative to the Sun and Earth increases. A waxing gibbous Moon from October 12th, headed towards Full this weekend. Image credit and copyright: John Brimacombe. The period when the Moon is waxing occurs between a New Moon and a Full Moon, which is characterized by many changes in appearance. The first is known as a Waxing crescent, where 1-49% of the Moon is illuminated. Which side appears illuminated will depend on the observer’s location. For those living in the northern hemisphere, the right side will appear illuminated; whereas for those in the southern hemisphere, the reverse is the case. Next up is the First Quarter, where 50% of the Moon’s face is illuminated – again, the right side for those in the northern hemisphere and the left for those in the south. 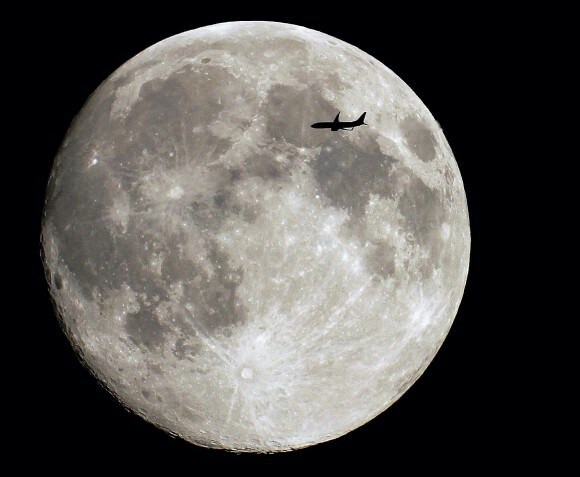 This is followed by a Waxing Gibbous Moon, where 51 – 99% of the Moon’s surface is illuminated – right side in the northern hemisphere, left side in the southern. The waxing phase concludes with a Full Moon. We have written many articles about the Moon here at Universe Today. Here’s What are the Phases of the Moon?, What is a Waning Moon?, What is a Hunter’s Moon?, A Red Moon – Not a Sign of the Apocalypse!, How Did the Moon Form? and What is the Distance to the Moon? NASA has a cool list of all the Moon phases over the course of 6000 years. And here’s a calculator that shows the current phase of the Moon. 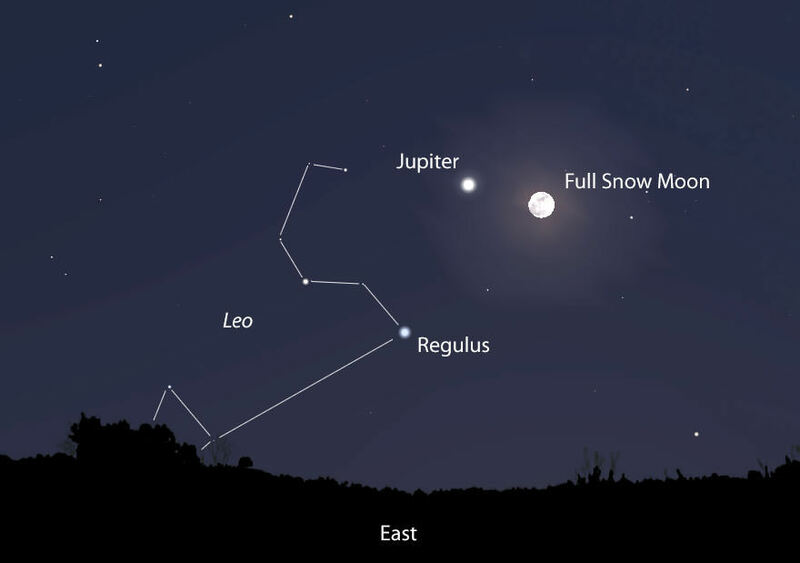 Earth’s Sky – Where’s the Moon? Did you see the Moon last night? I walked outside at 10:30 p.m. and was stunned to see a dark, burnt-orange Full Moon as if September’s eclipse had arrived a month early. Why? Heavy smoke from forest fires in Washington, California and Montana has now spread to cover nearly half the country in a smoky pall, soaking up starlight and muting the moonlight. If this is what global warming has in store for us, skywatchers will soon have to take a forecast of “clear skies” with a huge grain of salt. By day, the sky appears the palest of blues. By night, the stars are few if any, and the Moon appears faint, the color of fire and strangely remote. Despite last night’s clear skies, only the star Vega managed to penetrate the gloom. I never saw my shadow even at midnight when the Moon had climbed high into the southern sky. We’ve seen this smoke before. 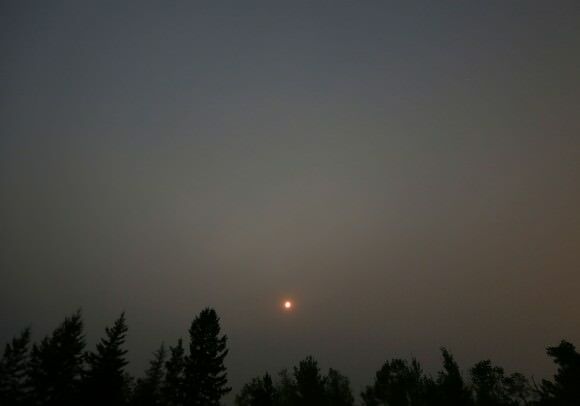 Back in July, Canadian forest fires wafted south and west and covered much of the northern half of the U.S., giving us red suns in the middle of the afternoon and leaving only enough stars to count with two hands at night. On the bright side, the Moon is fascinating to observe. I set up the telescope last night and spend a half hour watching this unexpected “eclipse”; sunsets appear positively atomic. The size of the smoke particles is just right for filtering out or scattering away blues, greens and even yellow from white light. Vivid reds, pinks and oranges remain to tint anything bright enough to penetrate the haze. But smoke can cause harm, too. Forest fire smoke contains carbon monoxide, carbon dioxide and soot. On especially smoky days, you can even smell the odor of burning trees in the air at ground level. Some may suffer from burning eyes, asthma or bronchitis on especially smoky days even a thousand miles from the source fires. On clear, blue-sky days, I’ve watched the smoke creep in from the west. It begins a light haze and slowly covers the entire sky in a matter of several hours, often showing a banded structure in the direction of the Sun. 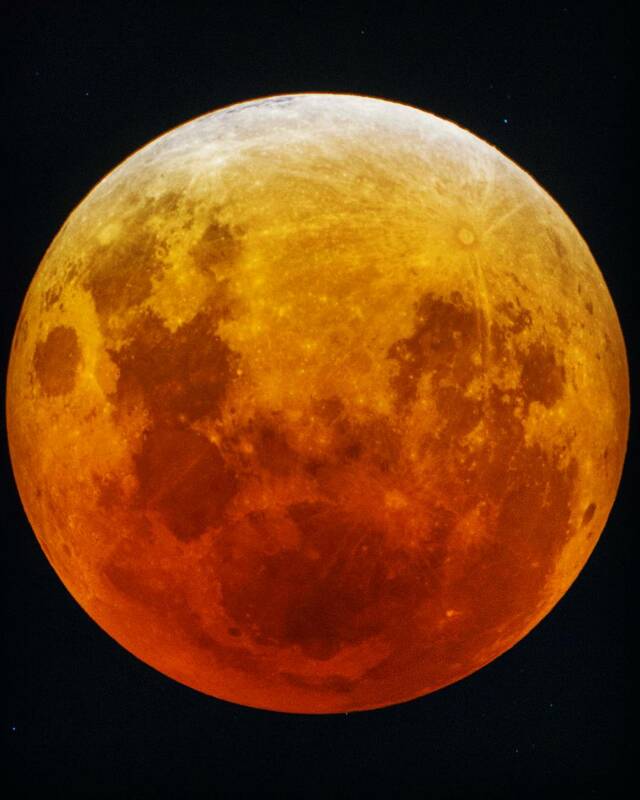 A little smoke is OK for observing, but once it’s thick enough to redden the Moon even hours after moonrise, you can forget about using your telescope for stargazing. Sometimes, a passing thunderstorm and cold front clears the sky again. Sometimes not. The only cures for fire soot are good old-fashioned rain and the colder weather that arrives with fall. In the meantime, many of us will spend our evenings reading about the stars instead of looking at them. Wow! The astrophotographers out there are getting artsy! Take a look at some of the most artistic images of the full Moon we’ve seen yet. A comparison the between two ‘extreme’ full Moons of 2014: the perigee Full Moon of August 10th, and the apogee full Moon of January 16. As seen from Central Italy. Credit and copyright: Giuseppe Petricca. 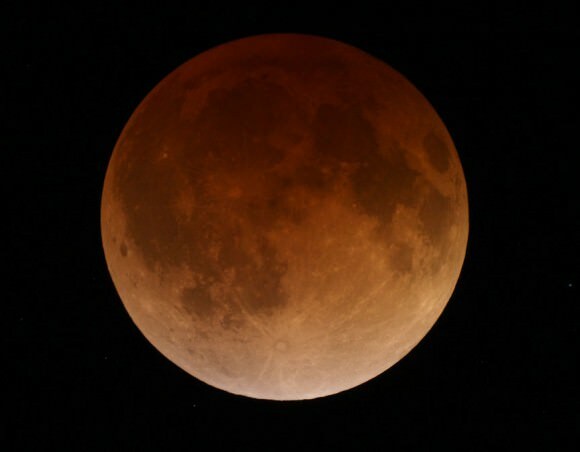 The August 10, 2014 ‘super’ Moon. Credit and copyright: Robbie Ambrose. Supermoon timelapse composite on August 10 near the ship mast at Barnegat Light on Long Beach Island, New Jersey. Credit and copyright: FrankM301 on Flickr. A cloudy look at the perigee Moon of August 10, 2014 along side the Desde el Obelisco, Malecón de Santo Domingo, Dominican Republic. Credit and copyright: Goku Abreu. ‘Super’ Moon, August 10, 2014, taken with Nikon D80 from Ottawa, Canada. Credit and copyright: Andrew Symes. Super Moon (and a companion) rising over Brixton, South London. 10/08/2014. Credit and copyright: Owen Llewellyn. Camaro and Full Moon – Aug 9, 2014.Taken from the Cairns Wharf in Australia at dusk using an iPhone 5. Three frames; two exposures each. Credit and copyright: Joseph Brimacombe. It was prom night in Cairns… so the fancy cars were out. 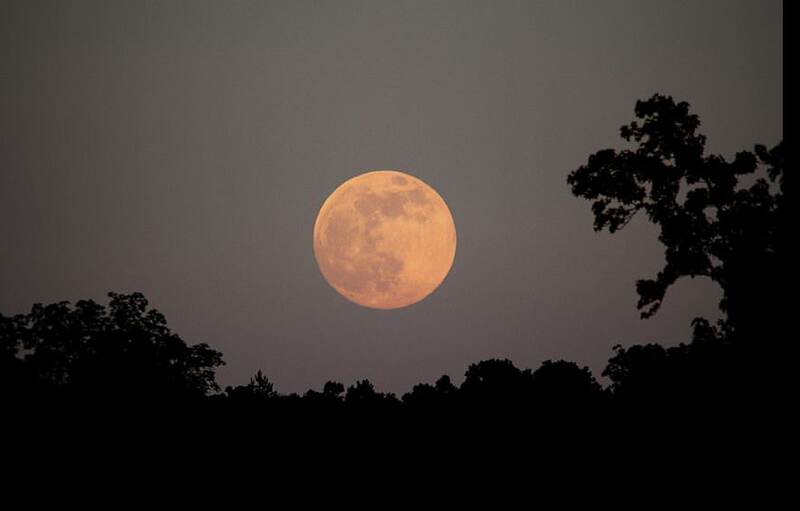 See Joseph’s other “prom supermoon” image here. People watch the nearly ‘super’ Moon rise on August 9, 2014 near a lighthouse. Credit and copyright: Will Nourse. Perigee Full Moon mosaic from August 10, 2014 (a first attempt at a mosaic!) Credit and copyright: Mary Spicer. Perigee Moon rise over London on August 10, 2014. Credit and copyright: Sculptor Lil. The perigee Moon from Toronto, Canada at 8:35 pm EDT. Credit and copyright: Rick Ellis. A full Moon flyby, as seen from Paris, France. Credit and copyright: Sebastien Lebrigand. Why Do People Go Crazy During a Full Moon? Have you ever heard that people go crazy during a full Moon? What’s going on to cause all this lunacy? Or maybe, just maybe, it’s all a myth and nothing special ever happens during full moons. If I went crazy, like real actual cluster-cuss crazy, you might call me a lunatic. Or you might say I suffered from lunacy. What does that even mean? This word comes from lunaticus, meaning “of the moon” or moonstruck. It was more popular during the late 1800’s, yet it still hangs around. Surely it must still be an important and useful diagnostic medical term. As when the Moon is full, everyone goes crazy. It’s called the lunar effect. Everyone knows that. Right? People have theorized for thousands of years that the Moon has all kinds of impacts on us. It affects fertility, crime rates, dog attacks, and increases blood loss during surgery. It must be a full Moon, they say. Full moon tomorrow night! All the crazies will be out! they say. So what causes all this moon madness. What makes us sprout metaphorical canines and race around in a fugue state hungry for manflesh when the moon is full? Are we experiencing tidal forces from the Moon on our internal organ juices? Is it a result of us evolving lockstep with the lunar cycle? Perhaps the light coming from the Moon affects our visual cortex in a way to stimulate the animalistic parts of the brain? It has been with us for so long as a belief, there must be something to it. Right? Nope, it’s all a myth. All of it. Tidal effects on behaviour aren’t happening. We experience two high and two low tides every day, and it has nothing to do with the phase of the Moon. In fact, your body experiences more gravity from your chair than it does from the Moon. If the motion of blood was somehow that reactive, should you step into a full elevator everyone would pass out with all the blood rushing to their extremities pulled by your gravity. No way! You say! It’s true! Because the Moon is closer when it’s full, and its tug on our “materia” and “humors” is stronger. Unfortunately for this theory, our Moon travels an elliptical orbit, and the time when the Moon is closest has nothing to do with when it’s full. The Moon can be full and close – supermoon. Or it can be full but farther away – minimoon. In 1985, a team of scientists did a meta study, looking at 37 separate research papers that attempted to study the Moon’s impact on all aspects of humanity. They found papers that demonstrated a correlation, and then promptly found the mistakes in the research. They found absolutely no evidence. We don’t get into more car accidents. Hospital rooms aren’t more crowded. Werewolves aren’t apparently a thing. We do notice the coincidences, when something strange occurs and there happens to be a full Moon. But we don’t notice all the times when there wasn’t a full Moon. To learn more about this, I’d suggest heading over to the wonderful blog “You are not so smart” by David McRaney, and reading up on “Confirmation Bias”. So, where did this idea come from? Historians suspect it’s possible that the brightness of a full moon disturbed people’s sleep schedules. I’m partial to the idea that in history, the full Moon was a high time for people to be active at night, favoring work or travel by the light of the full moon. So, perhaps there were more accidents. But not any more. People are superstitious about mundane things like black cats, ladders and broken mirrors, it’s not surprising they’re superstitious about our beautiful and bright companion prettying up the sky almost every night. What do you think? What’s your favorite full moon superstition? Tell us in the comments below.